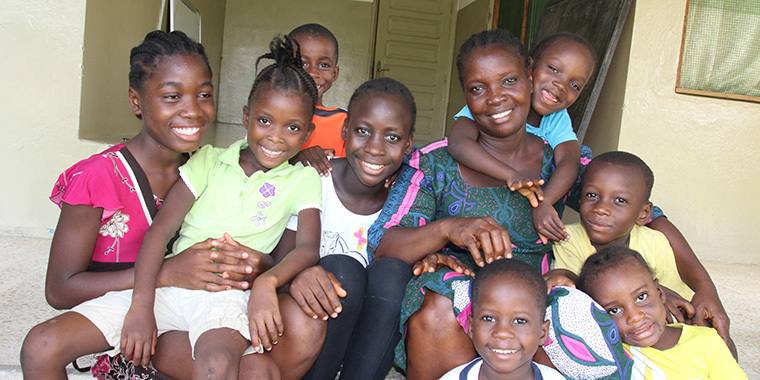 Becky* and Ishmael* play happily with their SOS mother and siblings in the SOS Children’s Village Monrovia in Liberia. It is easy to forget the circumstances that took them there more than three years ago, after losing their parents during the Ebola outbreak – yet the specter of the disease still lingers in the region. SOS Children’s Villages DRC promotes good hygiene at its Villages and runs community programs to thwart the spread of the Ebola virus and other diseases. During the 2014-2016 crisis, SOS Children’s Villages provided on the ground support for medical workers and the local community, in addition to working to keep children and families in SOS programs safe from the disease. The SOS Medical Centre in Monrovia, Liberia, was one of very few health facilities in the country that was continuously operating throughout the Ebola outbreak. SOS Children’s Villages provided the center‘s staff with protective suits so they could stay open. The center treated more than 2,200 survivors of Ebola and children with post-Ebola health complications.